These Colored Hanging File Folders are perfect for color-coded organization. They include label inserts and tabs for placement in 5 positions. Durable coated hangers slide easily on rails. Letter size, green. 50 Per box. 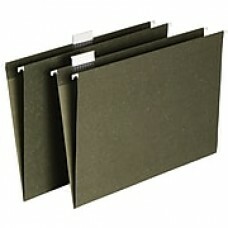 Organize your files and keep important documents within easy reach by using these hanging file folders from Staples. Each box comes with fifty files, so you can fill your entire filing cabinet, box, or storage rack. These hanging files are made of durable standard-weight 11-point paper, so they'll hold up to frequent use. The files are made of 10 percent post-consumer recycled material for more environmental responsibility. Each file folder has five 1/5-cut tab cuts, so you can place the tabs in whatever position you want. The actual tabs and inserts are included as well. These files have coated hangers that slide easily, so they're easy to maneuver. Make access simple by slipping some manila file folders inside the hanging files so that you can remove the entire stack of documents without losing any.